Hello, my name is Corbin Lichtinger. I farm a small tract of land located in Cussewago Bottoms, roughly ten miles north of Meadville and thirty miles south of Erie, Pennsylvania. The farm I have worked on for the past two years is called Fresh From the Vines. 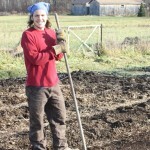 It identifies as a small, family farm that exercises organic methods, in a sustainable fashion. We have chosen to refrain for procuring the USDA organic certification because it is simply too expensive and time-consuming—for us. Instead, we are a member of the Pennsylvania Association for Sustainable Agriculture (PASA), and choose to practice organic harvesting by standards we consider to be more stringent than those outlined by the federal government. 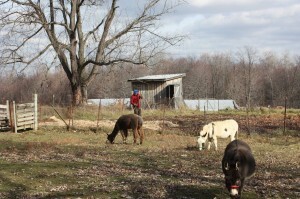 The farm is owned by a wife and husband (Rebecca and David Vines), and is staffed on a fairly seasonal basis. Located on roughly sixty-acres of land that is mostly wooded, we currently farm approximately six acres. On those six acres stands two high-tunnels, for growing crops that are more climate sensitive than others (i.e. herbs, indeterminate tomatoes, lettuce, peppers); field space that rotates between on a yearly basis between potatoes, garlic, squash varieties, and corn; two small fruit orchards for growing apples, pears, and blueberries; along with a fenced garden that contains twenty-four raised beds. This past year, we worked diligently to provide produce to a twenty-member CSA, in addition to having a stand at the local farmer’s market on Saturday’s, and selling produce throughout the week at the Whole Foods Co-op. We also have a bakery on the property that is utilized year-round to bake breads and an assortment of sweets for local markets in Meadville and in Erie, PA. All of the ingredients used in the bakery are certified organic, and sourced as locally as possible. In the middle of all of this commotion, stands a small hay-barn. This hay-barn, once furnished with a cot, reading light, and portable radio (but now with hay bails for the winter) served as my home this past summer. 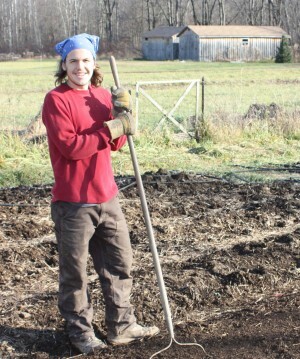 I experienced nothing more fulfilling than living on the land that I helped farm this summer. It has been such empowering experience farming, from the day I sow the seeds to the day I harvest for market. Each day I am lucky enough to work out in the fields I am taken aback by the intellectually rich experience I have, from recognizing the most rudimental nuances of life on the farm. I am truly grateful for the invaluable lessons I have learned on the farm, and look forward to continue farming in the future. I am slightly unsure of the specifics of my interaction with farming in the coming months and years, but I know it will play an integral role in my everyday life, and my overall well-being.